Run a Twitter giveaway to increase your followers and reward them for engagement. A Twitter giveaway is an effective strategy to encourage brand loyalty, drive traffic to your profile, and make your online content go viral. Retweets: Run a sweepstakes between all users who retweet one or more of your tweets. You can also require participants to Follow your profile, as part of the same contest. 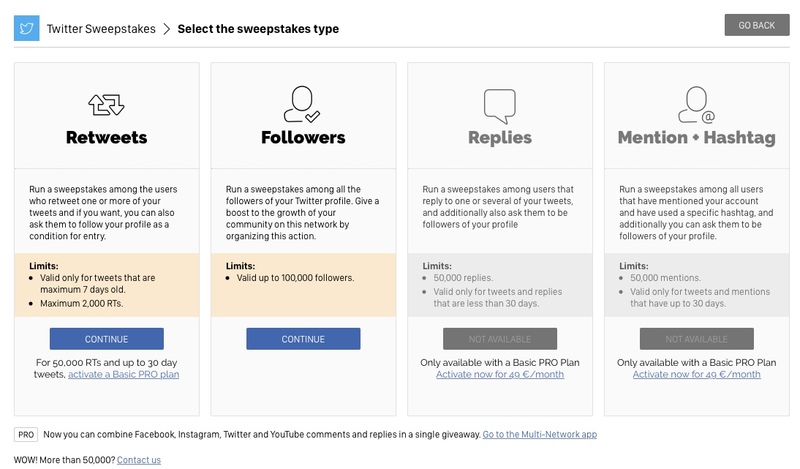 Followers: Run a sweepstakes between all your Twitter followers. Replies: Run a sweepstakes between users who reply to one or more of your tweets. You can also require participants to Follow your profile, as part of the same contest. Mention + Hashtag: Carry out a sweepstakes between all users who have mentioned your Twitter profile and used a specific hashtag. You can also require participants to Follow your profile, as part of the same contest. The first Retweets contest is free. It is limited to a maximum of 5,000 retweets which are less than 7 days old. Basic plan($29/month). Your giveaways can process a maximum of 5,000 retweets tweets which are less than 7 days old. Basic PRO plan ($49/month). Your giveaways can process unlimited retweets up to 30 days old. The first Followers contest is free. It is limited to Twitter accounts with a maximum of 200,000 followers. After your free trial a Basic plan ($29/month) or higher is required. Replies contests are only available with a Basic PRO plan ($49/month). Mention + Hashtag contests are only available with a Basic PRO plan ($49/month). Check out our price comparison table to learn more about pricing and limits. 1. Click Create New Promotion to begin setting up your sweepstakes. Note: Users who retweet but have protected their tweets won’t be included in the sweepstakes. 8. 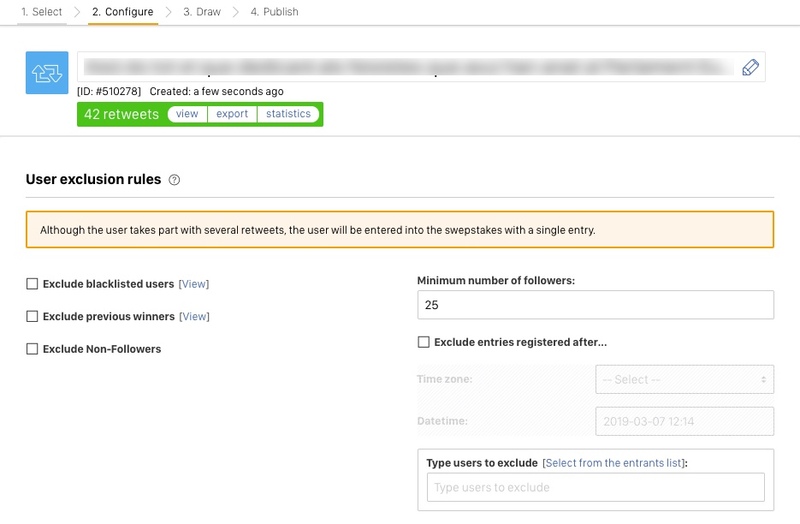 If you want to run a Twitter contest for followers, you don't need to take action yet. Go directly to Step 3, below. 9. If you want to run a Twitter giveaway withMention + Hashtag, add your hashtag to the tracking list. Set the date when you want the promotion to start. On this date, the Easypromos app will start importing any tweet which contains your hashtag and @mentions your account. Note: When clicking on the "Continue" button, the system will automatically import all the tweets published on Twitter with the specified hashtag and, in addition, include the mention of your Twitter account. The system will be based on the Twitter account you connected in step 4. You're now on the promotion management page. 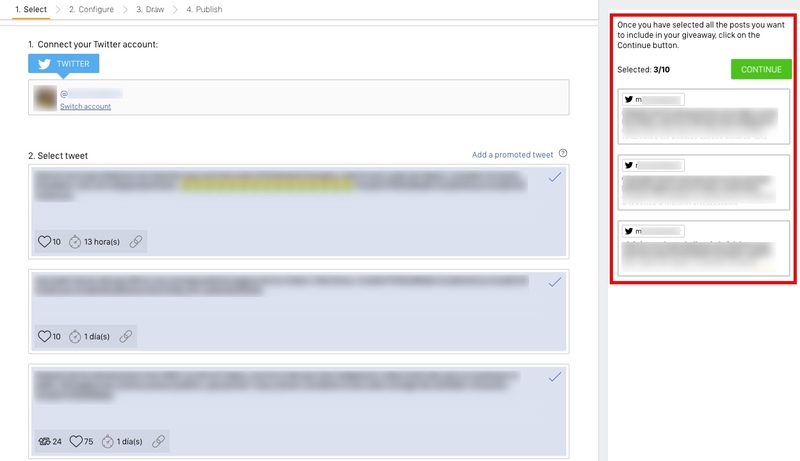 You should see the title of your promotion, followed by the number of participants and options to view their data. You can also access filters and user exclusion tools from this page. Require users to include up to 5 mentions in their tweet or reply, in order to participate in the contest. Filter finalists by the hashtags used in the tweet. Learn more about your options for filters and exclusions. 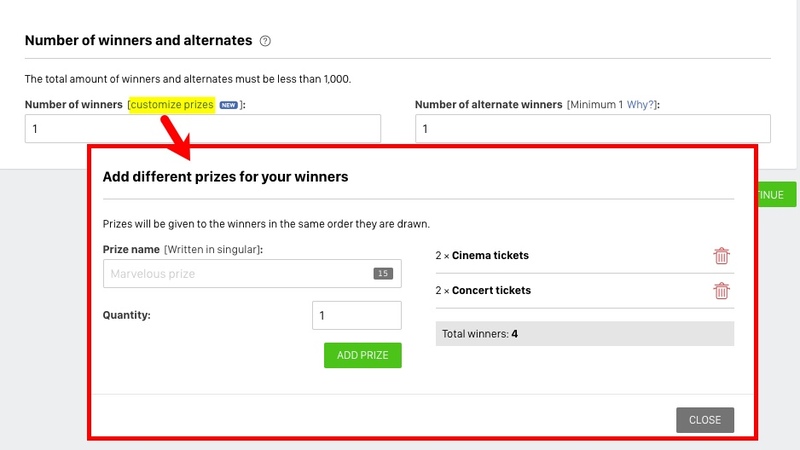 Choose how many winners and alternate winners your contest will have. 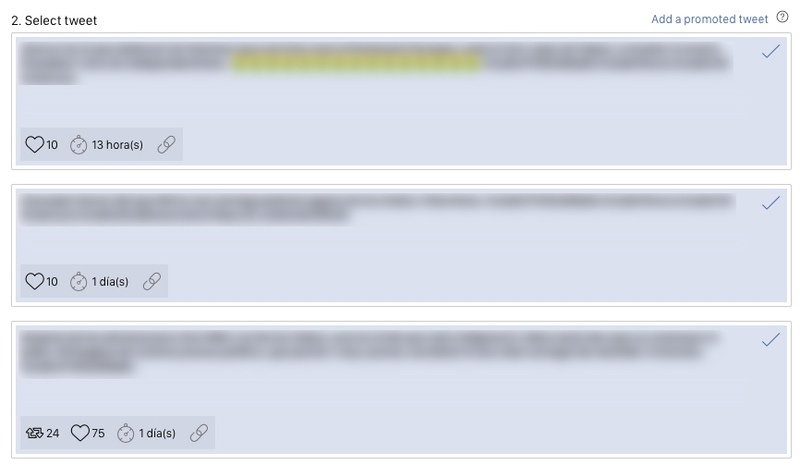 We always recommend including alternates, in case you can't contact the winners or they are disqualified. Note: The total number of winners and alternates must be below 1,000. Click Continue, and you’ll be taken the Test Page. 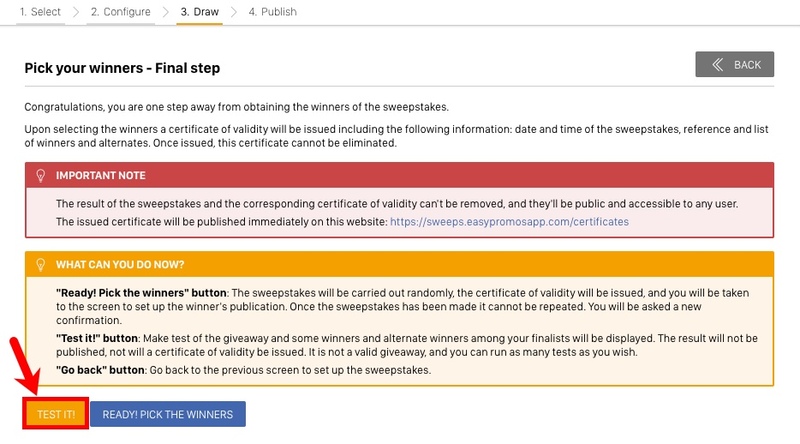 Before carrying out the giveaway, you can run a test to check that it's working correctly. You’ll also see a preview of how the winners will be shown when the contest ends. 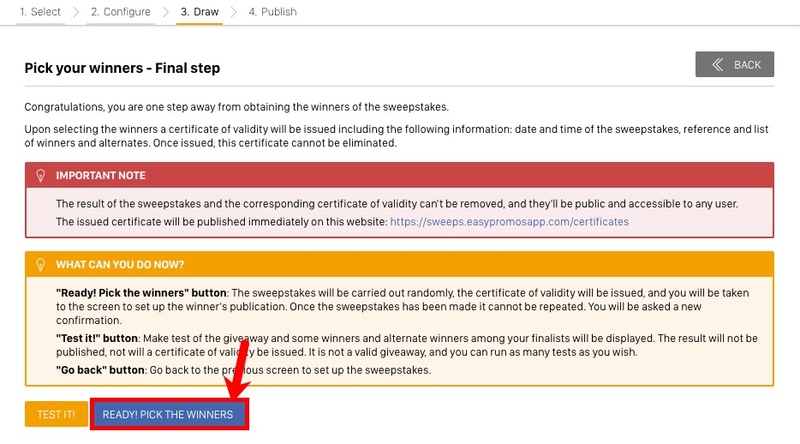 Note: The option to carry out a test is not available in the first free sweepstakes. Once you’re ready, tell the system to carry out the giveaway. Simply click "Ready! Pick the winners" and the Easypromos system will select a winner at random. Once you have taken this step, the prize draw cannot be repeated. Congratulations! You've successfully completed the giveaway. Your browser will display a screen with the results. Now you can start thinking about announcing the winners publicly and sharing the prize. You can view a list of the winners and alternates. You can manage and even change the winners, if necessary. Certificate of Validity. A Certificate of Validity is created, guaranteeing that a single, random giveaway has been carried out. This certificate cannot be modified. Share it with your followers to show that your brand is transparent and trustworthy. Winners Page. 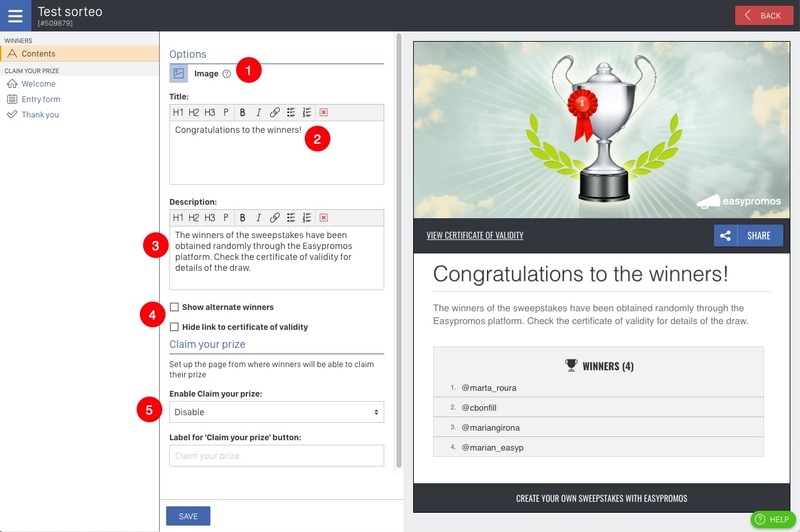 Easypromos creates a microsite to display winners and alternates of the giveaway. Share this page to announce the results! You can even customize the page for your branding and design. When the Winners Page is ready, share it across social media. 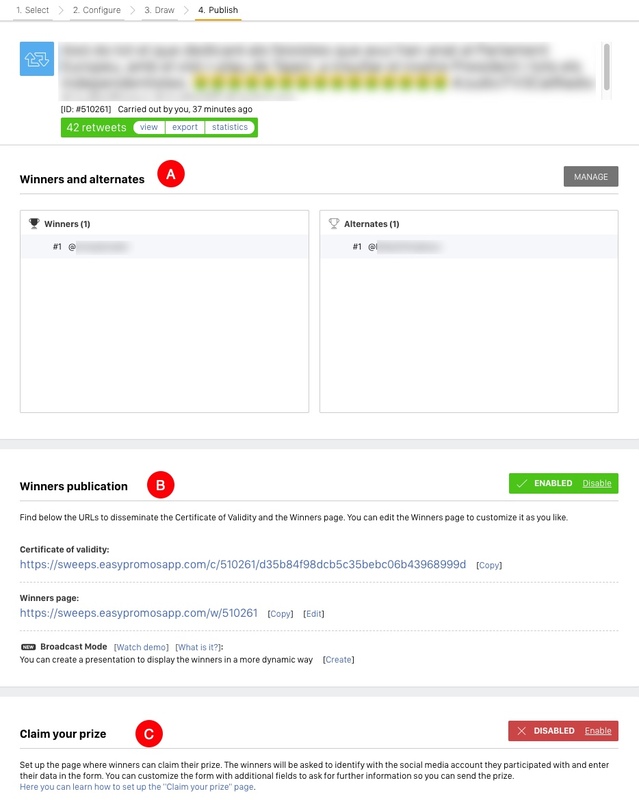 You can copy the Winners Page URL and share it directly. See who has claimed their prize, and view any personal details they’ve provided. Download all the information provided by prizewinners to an Excel file.